Sorry this is a bit late but we had a traumatic week her in Ottawa and then I had company in town to see Fleetwood Mac this weekend. 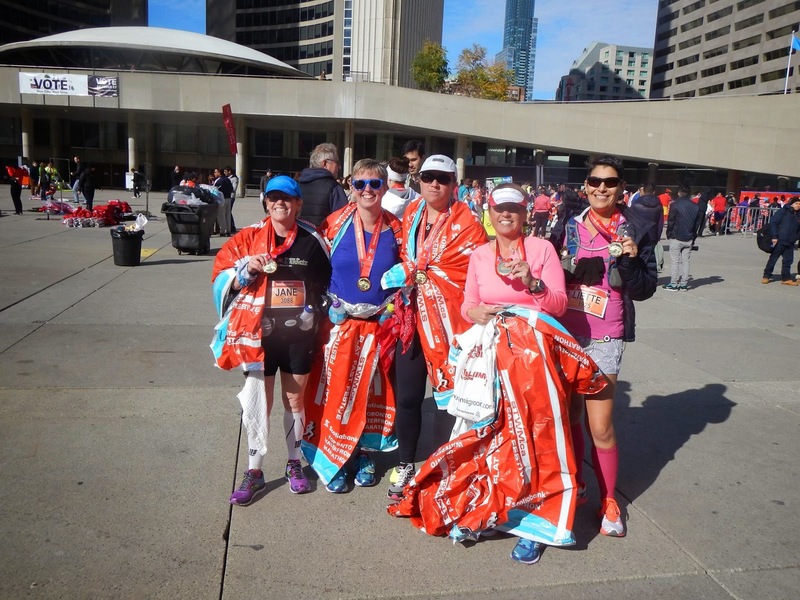 I ran my third marathon on Oct 18th in Toronto and I have to say it was a hard run but I was happy with the results. I had a rough summer of training and as I headed into the marathon, I was nursing some leg issues, left hamstring and my glutes were playing up but I was going to do the best I could and get it done. It was a cool morning but clear, almost perfect running conditions and as Barbara and I started I was happy to be there. The first 21.1K went great, I was almost on pace and the km were going by fast. At the half marathon point Barbara and I parted ways and I headed out on my own. I felt really good until til the 29K mark and them my hamstring started to hurt and my pace started to slow. By the time I got to the turnaround point at my glutes and hip flexors joined in the pity party and I was hurting. The marathon had runners to help you during the last 10km if you were sufferring, they are called Bonnie`s Angels. I was happy to have my own angel run with me for my worst 4km, from 35 to 39km. Once I hit the last overpass, I knew the end was near and I thanked my angel and picked up my pace for the last 3.2 km to the finish line. My watch stopped when I made my 2 potty stops so I did not know if I was ahead of or behind my Chicago time but I powered on. During the dark period I on the run I thought about my IM next year and wondered how I was suppose to run a marathon after swimming and biking all day. I also swore I would never run a marathon again...EVER!!! I happily accepted my medal and stretched while I waited for Barbara to finish, she was only 3 mins behind me and we headed off to get our food and wait for our friends to finish. I stopped by the sports stats tent to check my time and was thrilled to find out I had run 30 seconds faster then my Chicago time, despite my legs no co-operating I got a PB and it capped off the day, official time 4:51:24. On and I am already planning marathon 4 and 5 for next year! Jane, Barbara, Kiza, Liette and me, we all finished! Wow, awesome! Congrats on the PB! I have never heard of marathon helpers, what an excellent idea though. I said the same thing during every single marathon I've run- never again. But like you, I always do!! Bonnie's Angels they are called. They are coming to Ottawa next May for the marathon and I might pay it forward by volunteering with them since I am running a marathon in early May. Glad you are back running, good job on the half last weekend.